Camphill Village Trust Care Farm Manager, Robin Asquith was part of a group from the NFU who, at the end of last year, visited farmers in Kenya who have benefited from Farm Africa’s work. One of the projects they visited was ‘Growing Futures’. Set up in 2016, it has helped 446 young farmers in 23 farmer groups launch profitable horticultural businesses. In total, those businesses have sold vegetables worth £230,000, boosting farmers’ incomes by £165,000. 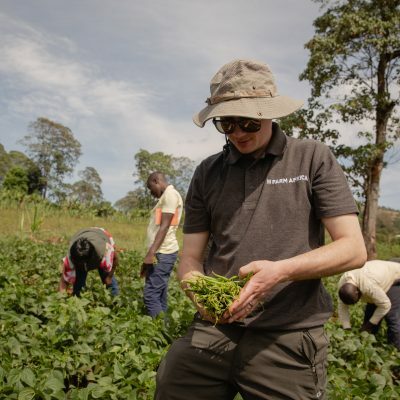 Our Care Farm Manager, Robin Asquith joined York-based Adam Bedford on the trip, and Adam is now preparing to run the London Marathon on 28th April, in aid of the Farm Africa charity. Robin said that farmers in both the UK and Africa face the same issues. “Although very different climates, farmers in Africa and the UK share many similar problems. The overwhelming positive of the African farms we visited was the sense of community and working together spirit. An article on the Farm Africa trip has been published in the Yorkshire Post, this week.